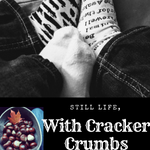 February | 2017 | Still Life, With Cracker Crumbs.. Growing up, I was a huge Little House on the Prairie fangirl. Not the show, but the books. (Little secret, I still reread them every year.) One of my favorite parts in Little House in the Big Woods is the Sugar Snow, when the whole family, aunts, uncles, grandparents, cousins, all get together and tap the trees for the sap to make maple syrup. There is snow and dancing and frivolity, and of course, fresh maple syrup served on top of fresh fallen snow. I have actually never tried that but I am sure back then it was a delicious treat. 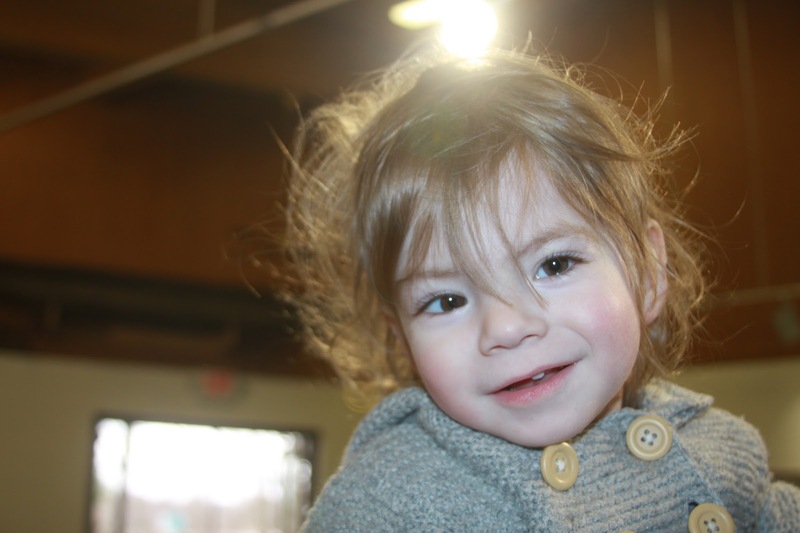 Our local Metropark system has maple sugaring events every year, and every year we miss them. I was bound and determined to get to one this year, and so Saturday morning, amidst snow flurries, we were over the river and through the woods to Oakwoods Metropark by the start of the program. One of our favorite interpreters was leading the event, which was cool, and when we got there, we learned we were the only people signed up for the early program. So our little family had our very own private lesson. Just our little badger boy enjoying the day out. It takes 40 gallons of sap to make one gallon of maple syrup. Maple trees have opposite branches, not alternating branches. You can make maple syrup from Black Walnut trees, although it will be a little more bitter. It actually isn’t a very complicated process; in fact, it is something you can do in your own backyard if you have a maple tree. 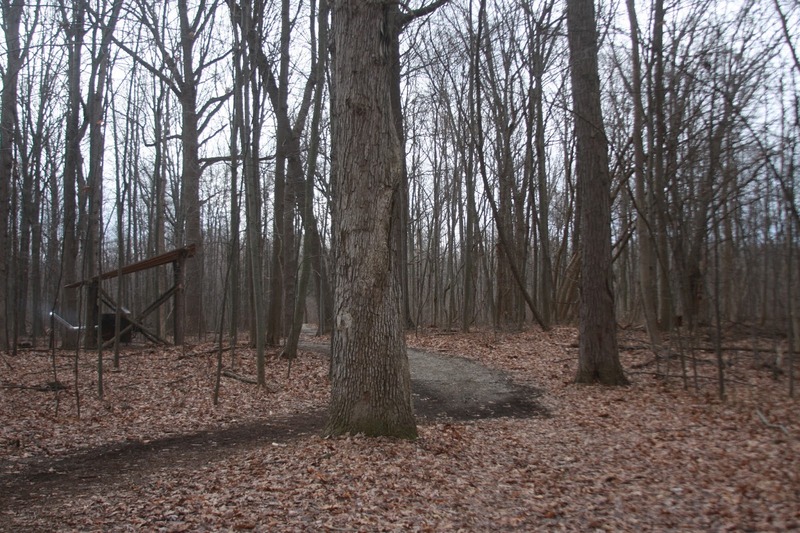 A grove of maple trees is called a sugarbush. Unfortunately, maple syrup production is at risk right now due to the springlike weather we have been having. It needs to be cold at night but warm during the day for the sap to flow. The cold temps cause the sugar content to rise, and with these warmer days, the syrup may turn bitter in flavor. I don’t know about you, but I much prefer real maple syrup to the manufactured versions. I can put up with a few more weeks of winter in order to have that delicious caramel taste of real maple syrup. We also heard two very different Native American origin stories regarding maple syrup, as maple syrup was a staple of the Native American diet in this area. If you are interested, here is a link to the Ojibway legend of maple syrup. The program was about an hour long, and although we were the only ones there, Kevin did not hurry or skip any part of the program. Billy and I both found it very informative, and inspiring actually. We dream of homesteading one day, and maple syrup collection would be a fun addition to that dream. Overall, we had a great time, and ended up staying and sitting by the fire for a bit chatting. It was a nice way to start a day. We learned so much more than I have related here, but I encourage you to check out a program if you have one near you. If you are in southeast Michigan, the Huron-Clinton metroparks seem to be doing a few more events. 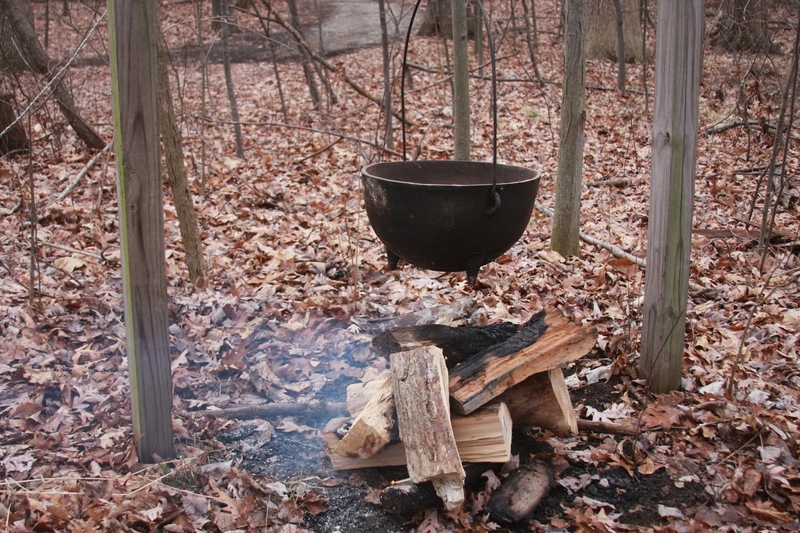 For more information on Michigan’s maple syrup industry, you can check out this page. It’s been eons since my husband Billy and I have gone out on a proper dinner date. One where we got to encounter new foods, new sounds, a new experience and really, to spend time with each other just the two of us. This building is way cool, which is not depicted in this photo. Lol. The restaurant is in the Grand Army of the Republic Building in Detroit, and it looks castle-like. Republic is a scratch kitchen, meaning they make everything from scratch. They also locally source as much as they can, which is pretty darn awesome. Since it is locally sourced, it is also seasonal. The restaurant was packed, as I had anticipated. 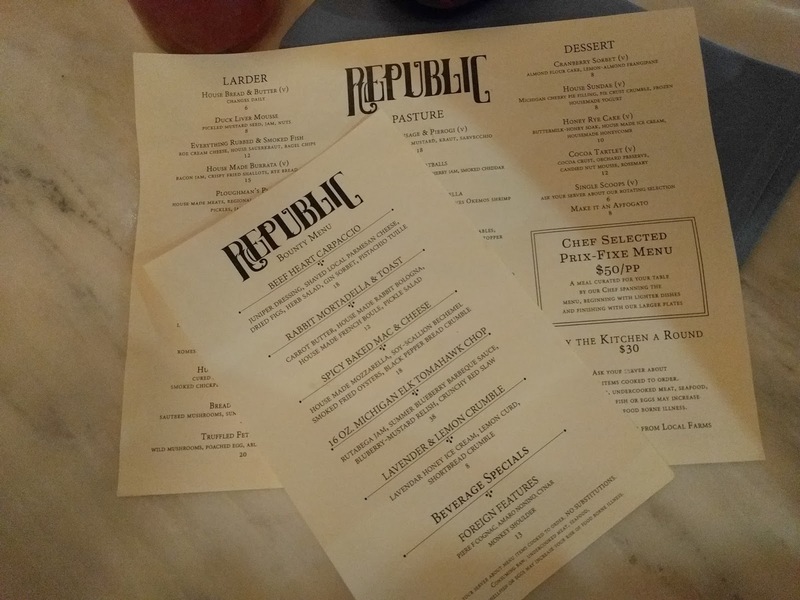 Luckily, Republic takes reservations, something I am finding that less and less restaurants do. I love reservations, especially now that I am a parent. I don’t have the luxury of waiting for a table anymore. My time is limited, so when I go out to eat, I want to know I can go in and get a table. So yay Republic! The crowd was a little older, maybe late thirties and up, except for at the bar, which seemed to hit all age ranges. The hum of conversation was perfect – not so loud you had to shout, but not so quiet that you felt weird talking at a normal volume. The drink menu had a few good wines and beer listed, as well as handmade specialty cocktails. They also offered a whiskey flight, which intrigued my husband, but he settled on a draft beer instead. I ordered a glass of Biutiful Malbec, and we settled back to peruse the menu. The waitress told us that the menu was designed for us to pick and choose and share, and that the food is served family style. It is also served as it is made, and is brought out as it is done. This wasn’t a problem for us, as we weren’t ordering very much, but I am curious as to how that works in a bigger group or with different food. 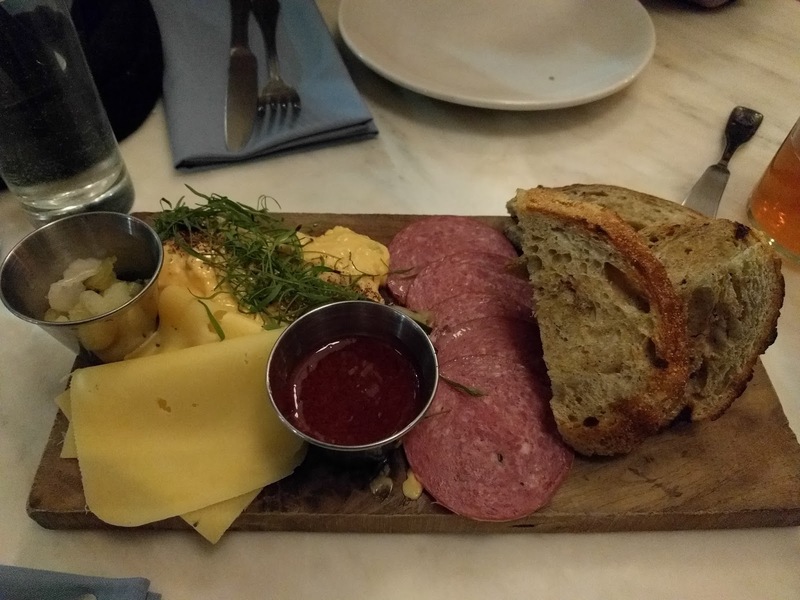 We started with the Ploughman’s Platter, which was amazing. Black pepper bread, pub cheese, a sharp cheddar, venison salami, pickled celery, actual pickles, and some sort of smoky tasting jam. 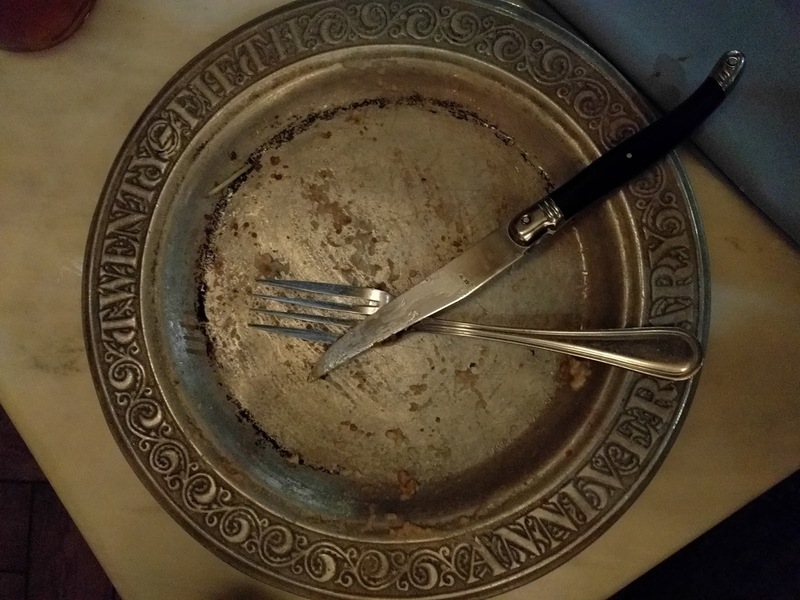 I didn’t care for the jam, it was like eating a bonfire, and I don’t eat meat, but the rest was so good. I could have eaten that pub cheese all night. The pickled celery was also amazeballs. We skipped the Greens section of the menu and went straight to the entrees, or Pasture, as they called it. I had the whole smoked trout, with aioli, nuts, and veggies. I knew to expect a head, since it said “whole” right in the description but I still couldn’t look at it. My husband and our awesome waitress discreetly took care of it for me. I thought the trout was very good, especially with the sauce. No complaints, but I also wouldn’t go wild over it. My husband on the other hand, did go crazy over his. 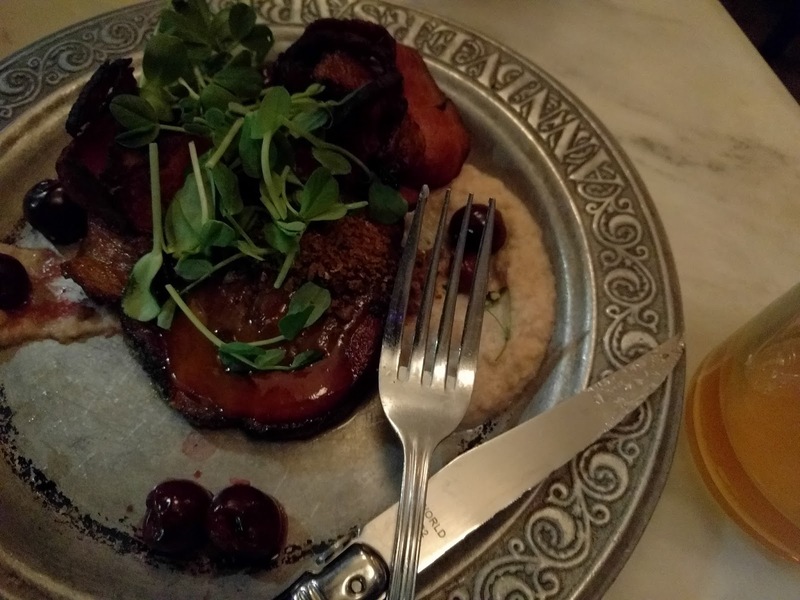 He ordered the Pork Steak, which was charred, and served with herbed jam, paneer, cherries and apple. It also had bacon with it. I think it is safe to say that he enjoyed it. We had also enjoyed a few drinks each by this point, so my photos get a little worse from here! But don’t worry, there is only one! For dessert we split the lavender lemon crumble, which was seriously the best part of the meal. It was tiny but delicious, a bijou jewel on the crown of the dinner. 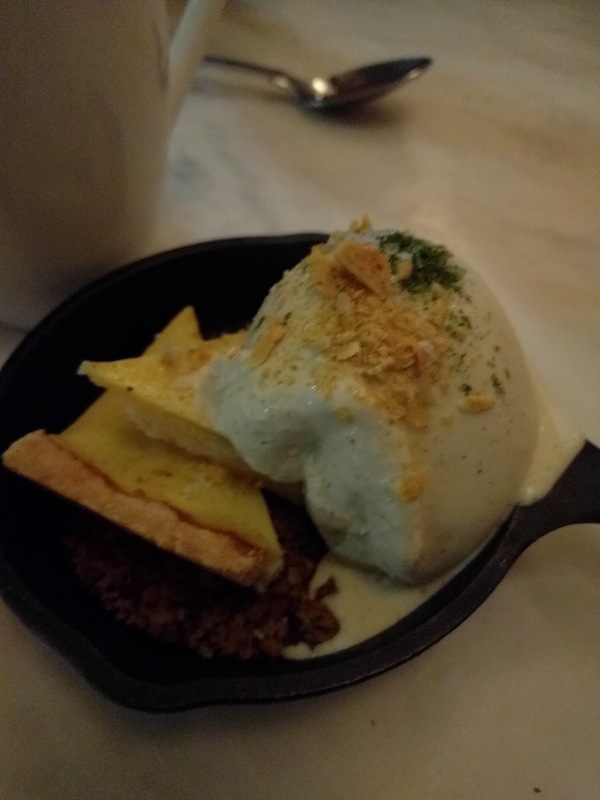 It was shortbread crumble, lavender and honey ice cream, with lemon curd. Oy. It tasted of summer and spring all at once. We had such a fabulous time, and laughed like lunatics, and just in general, had a blast. We don’t normally splurge on ourselves much anymore, and it was so nice to do so with my guy. 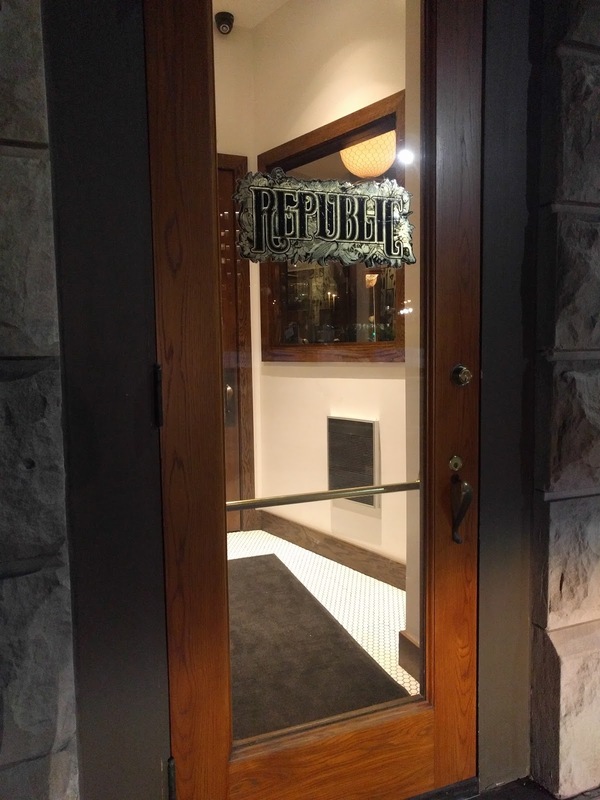 Overall, I highly recommend Republic to anyone who is interested in craft dining. They bill themselves as American Rustic, and I would agree that that is their style. If you are a vegetarian, it is maybe not the best option for a night out, but would be perfect for a nightcap and dessert, maybe after visiting the Opera House which is just across the way a bit. I love all these restaurant options in Detroit these days. We haven’t been to the city for dinner for a while (try two years! ), so we are behind on all the spots, but we are having fun discovering them!! Detroit’s food game is en pointe these days! February in Michigan can be tough. Gray, sunless, gray, cold. Did I mention gray? Michigan only had two days of sunshine in the past thirty days. 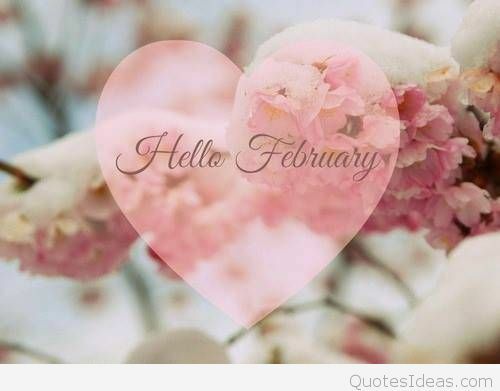 So this year, I decided I was going to try to embrace February to make it a cheerier month in our household. 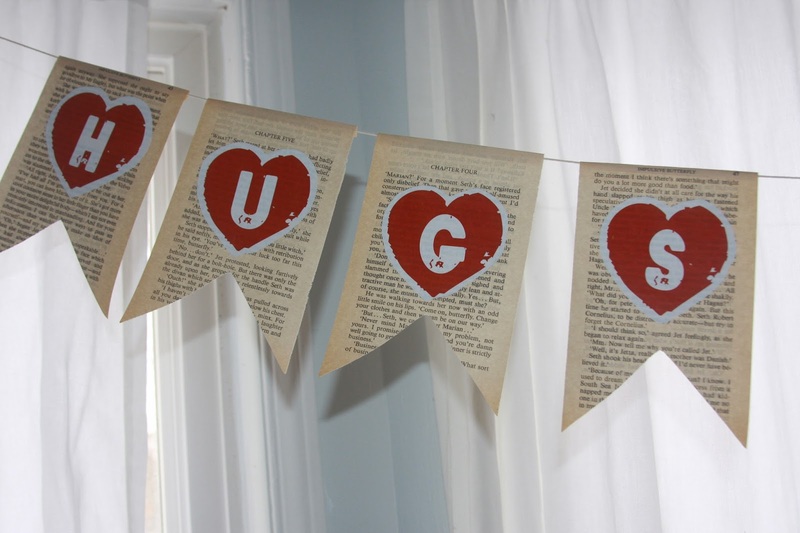 I usually don’t decorate for Valentines Day – typically I am not organized enough, and it has come and gone before I can do so! But this year, with the help of my amazing husband, we have managed to decorate in a very bijou and petite way. And that is a good start, I think! I have tons of ideas, I am always thinking of different projects. Unfortunately, my creative flow kind of ends there. I am all thumbs when it comes to crafting, I can’t draw, etc. Luckily, Billy can make anything. 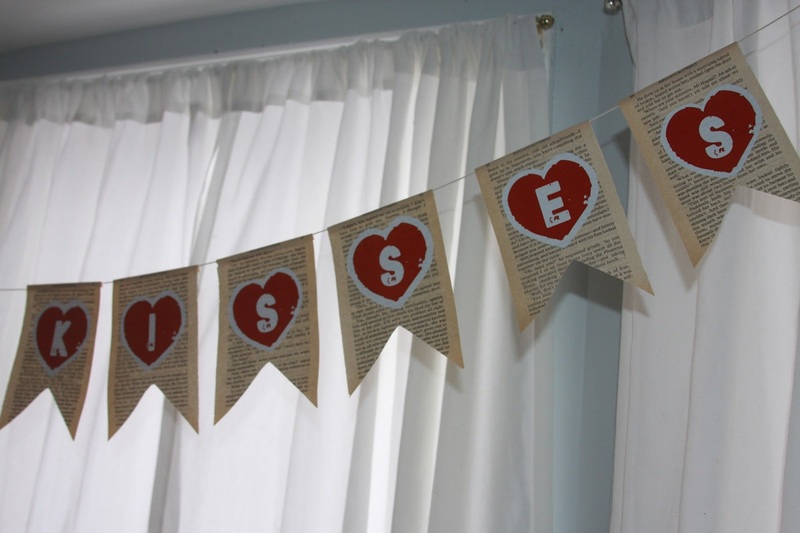 Today, he lent a hand in making a sweet little Valentines Day banner for our dining room. And I love it! The materials were simple, and cheap. A romance novel we rescued from the recycle bin at the library, that was already falling apart, and which my husband meticulously removed the pages from, sticker paper, twine, and a printer. Ordinarily I would not support this destruction of reading material, but honestly, this book was already falling apart. Billy then cut the pages into the little banner shapes, and folded over a teeny bit of the top of the page, so that he could run a line of twine through it to hang them. He just used some tape afterward to hold it all down. 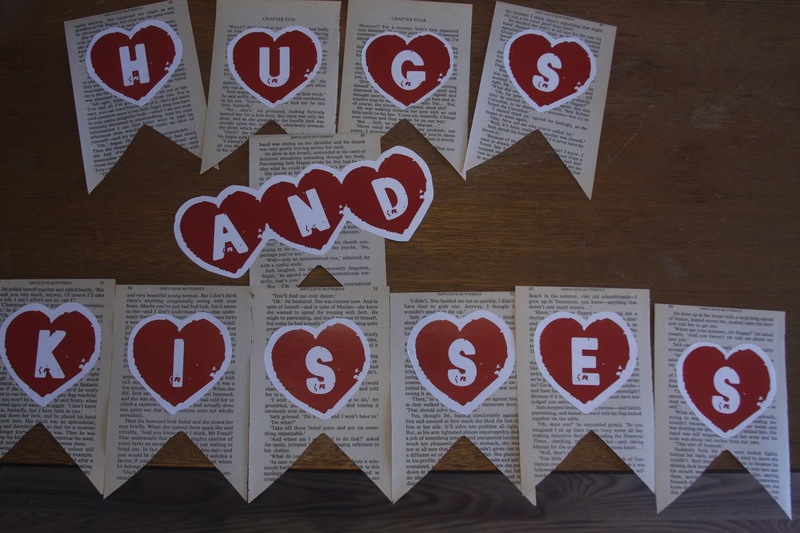 He had also printed out stickers spelling out Hugs and Kisses, using a free font that he found online, which he then just stuck onto the pages. I would link to the website of the font if he could remember where he got it from! As soon as I find out, I will add a link. Once this part was all put together, he strung them and hung it. Due to the absence of light in our state, it was really hard to take a photo! Sorry for the poor photo quality there. 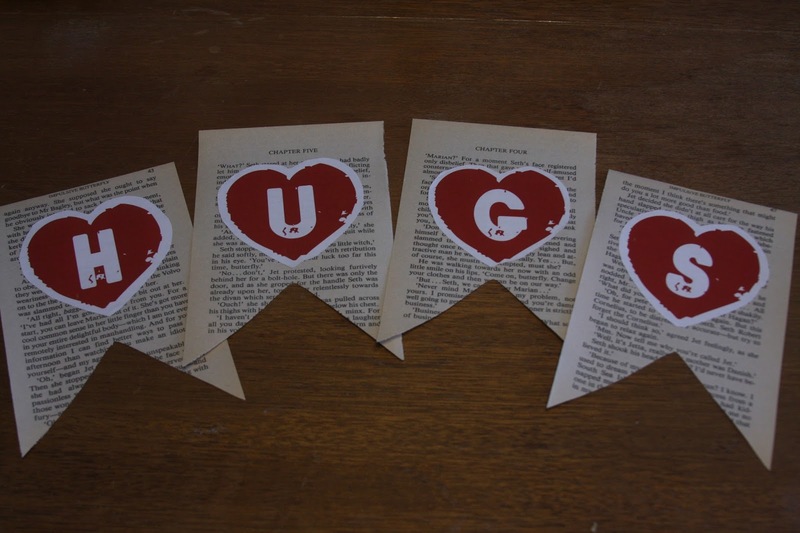 I have a few more Valentines Day surprises in the works, and I am excited to keep working on them! How are you celebrating this month? Anything planned?